I was a captain commanding a Force Recon platoon with the the 13th MEU in August 1990. We were beginning a routine deployment when orders came in diverting us to Southwest Asia. We knew something big was going down. The orders came from CENTCOM commanded by a giant bear of an Army officer, one General H. Norman Schwarzkopf. Yesterday in Tampa Florida where he had retired, Schwarzkopf died at aged 78 of complications from pneumonia bringing an end to the life of one of the United States most celebrated generals and commander of one of the most successful military campaigns in history. A New Jersey born Army brat, Schwarzkopf studied in Europe before attending West Point in his father's footsteps, graduating with a degree in engineering in '56. He served two tours in 'Nam, once as a battalion commander and among many other awards he earned three Silver Stars, including one for crawling through a minefield to rescue his wounded troops. Schwarzkopf stayed in service after Vietnam. During the 70's he attended U.S. Army War College and served on the Army General Staff at the Pentagon. Later he was Deputy Commander of U.S. Forces Alaska and then commanded, 1st Brigade, 9th Infantry. After getting his first star, Brigadier General Schwarzkopf served at PACOM, later Assistant Division Commander (Support) of the 8th Mechanized Division in Germany. 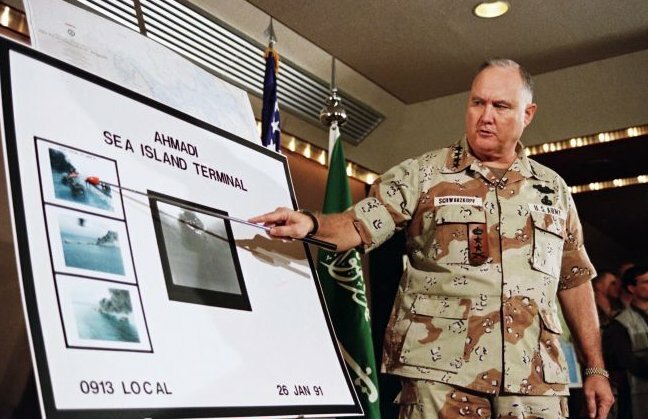 Major General Schwarzkopf was commander of the 24th Mechanized Infantry Division, at Fort Stewart, Georgia and became Deputy Commander of the Joint Task Force which invaded Grenada in 1983. Lt. General Schwarzkopf commanded I Corps before gaining his fourth star and taking command of CENTCOM in 1988. 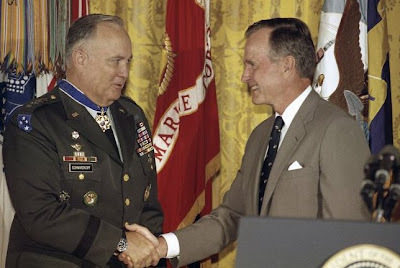 General Schwarzkopf capstoned his impressive career as combatant commander of Operation: Desert Storm, a U.S.-led international coalition of 30 nations organized by President George H.W. Bush, that succeeded in driving Saddam Hussein’s Iraqi forces out of Kuwait in 1991. Throughout his career Schwarzkopf earned Distinguished Service Medals from The Department of Defense and all branches of the armed forces including 4 from the army, three Silver Stars, the Legion of Merit, three Bronze Stars [and Combat 'V'], two Purple Hearts, seven Meritorious Service Medals, four Army Commendation Medals [and Combat 'V'], The U.S. Presidential Medal of Freedom, Knight Commander of Most Honourable Order of the Bath from the UK and Grand Officer of the Legion of Honour from france. He is survived by his wife Brenda and children Cynthia, Jessica and Christian.